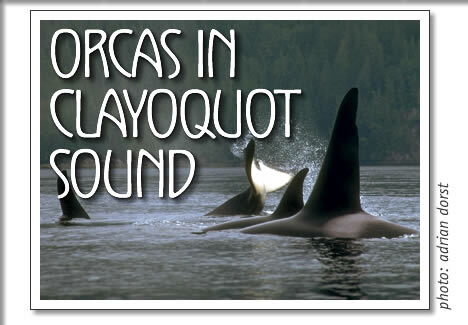 Arguably the most stunning animal on Tofino's west coast to be seen would be the Killer Whale, Orcinus orca. Being the largest member of the dolphin family these "Wolves of the sea" can be seen at any time of the year in Clayquot Sound. These marine mammals are black overall with striking white patches above the eye and from the lower jaw to the belly, and a fainter grayish-white saddle patch just under and behind the dorsal fin. All Orcas have a prominent triangular dorsal fin in the middle of the back that can be as big as 5'9". Orcas can reach up to 32 feet and weigh up to 10 tons. Killer whales live about as long as humans, reproducing over a similar age span. Most females first give birth at age 14 and bear four to six calves over the next 25 years then live into their seventies and eighties! Males mature also at age 14 and live to about 60 years. The society of resident killer whales is as rich and complex as that of humans, with family bonds that persist throughout their lifetimes. Killer whales live in groups that are organized along matrilineal lines, the basic social unit of the whales. Many of these groups are families that contain up to four generations of whales, consisting of three to nine individuals. Being opportunistic hunters the diet of the Orca is as varied as the situations they come across. Resident pods appear to feed primarily on a wide variety of fish such as salmon, herring, halibut, and cod. Transient pods feed primarily on any available species of marine mammal. Animals within a pod often feed cooperatively. When preying on large animals such as gray or humpback whales, the killer whales may attack as a pack, tearing away at the prey animal from several angles. When preying on schooling fish, smaller killer whales may swim close to the beach to drive the fish from shallow waters out to the rest of the pod. Large groups of killer whales are often involved in hunting schools of fish. Smaller groups are more often used when preying on marine mammals such as seals or porpoises. Living throughout nearly all the oceans and seas of the planet the Orca Whale is second only to humans as the most widely distributed mammal on the planet. At present their numbers are considered stable and abundant but there is concern for their health due to the effects of pollution causing toxicity in their food sources. The only enemy is human.